The Kundalini Reiki practices are perhaps one of the most simplest and easiest forms of energy based healing that we offer and provide a nice 'glimpse' into the world of energy based healing and meditation. The practices and techniques can be completed within around 5 minutes and you can become a Kundalini Reiki Master in just 2 weeks! The Kundalini Reiki healing energies are very effective in helping us to clear away energetic blockages from within as they bring us closer towards more purity, love and light in our life. After completing the Kundalini Reiki series, we invite you to continue on your Kundalini Healing journey by moving into the Advanced levels. The Advanced Kundalini Healing System offers an additional 7 levels which will help to expand and enhance the flow of Kundalini Reiki & Kundalini Healing energies from within you. We are very happy to offer you these beautiful and expansive Kundalini Reiki & Advanced Kundalini Healing systems here with much love & light and we hope that these can help to bring much healing, love & joy into your life! 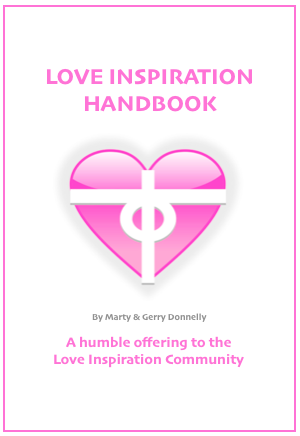 The Love Inspiration Handbook can help you to connect more deeply with these healing energies. ​During the first level, you will learn how to do hands-on healing (both for yourself and others) as well as something we refer to as distance healing. After a few days of practice, you are then able to progress through to level 2 where you will learn how to do a very simple 5 minute meditative technique which helps to cleanse your inner world as you prepare for the Kundalini Reiki Master level energies. ​The Master level is another truly beautiful step forwards as you are introduced to many different types of energetic frequencies and techniques. Of course, at this level, you will also learn how to attune others to this beautiful system of healing and growth; a gift which is always such a pleasure to share with others. All of this (and much more) is covered in the Kundalini Reiki ebook and we have made sure to cover absolutely everything that you will need to know to go about your healing and meditation practices. We understand the importance of having good information and we are very happy to share our ebooks with you with much love & light! We are delighted to have now received a series of Advanced Kundalini Healing energies which help to expand and extend the current Kundalini Reiki system as offered to you in the above section. These new energies and teachings have been received by Love Inspiration and can help to bring about a very significant amount of healing and purification! There are an additional six levels being learnt in this Advanced Kundalini Healing system with each level being very simple and easy to learn and practice. All of these are included in the free ebook so we truly hope that you will enjoy these beautiful Advanced Kundalini Healing energies in your meditation and healing practices! For those wishing to teach this system to others, the Advanced Kundalini Master Teacher level is available to you here noting that once you complete this level, you can attune any and all levels of Kundalini Reiki AND the more advanced Kundalini Healing levels very easily in one simple 10 minute sitting. ​into the Advanced Kundalini Healing Master Teacher level. Congratulations! Firstly though, please ensure that you have completed all of the pre-requisites for this course which includes giving a minimum of 50 healing sessions for others and a minimum of 100 self healing sessions using the Kundalini Blue Diamond energies. By completing these practices, you will now be unlocking the Master Teacher energies so that they can be received successfully during this course. Once you complete this Advanced Kundalini Healing Master Teacher training, you will now be able to attune all levels of the Kundalini Reiki system and the Advanced Kundalini Healing system with one very simple attunement technique!